Sacramento Is Ditching Polling Places For ‘Voter Centers.’ Will People Be Confused? Sacramento County is switching to a “voter center” model for today’s election, but some people are concerned the change may confuse voters. In the past, voters had to go to their specific precinct to vote in an election. Now, the county has adopted a new way, where people can go to any voting center to cast their ballot. This model was tested in San Mateo County three years ago. Jim Irizarry, that county’s assistant chief elections officer, says the system was a tremendous success. “It increased voter participation, it lowered election cost for the participating jurisdictions. It was an efficient election to administer,” Irizarry said. He added that the returns were processed quickly and they were able to determine the winner of the election clearly. A line of voters stood Tuesday morning in front of the McKinley Library in East Sacramento waiting for it to open. The library, a longtime polling place, has been relegated to a dropbox location as part of a new system approved by state legislators in 2016. Unlike polling places or the new vote centers, dropbox locations are only open during regular office or business hours. Since McKinley Library doesn't open until noon on Tuesdays, that also meant voters couldn't drop off ballots until that hour. "People are in the habit of voting the way they voted last time," said Kim Alexander, president and founder of the California Voter Foundation. California's nontraditional nonpartisan primary system could negatively affect Democrats running for the House and Republicans running in the state's races for governor and senator. Tuesday's primary election in California has political watchers riveted not just because of what's on the ballot but also because of the state's unusual primary system - the jungle primary. As Capital Public Radio's Ben Adler reports from Sacramento, the state is split on whether or not it's working. BEN ADLER, BYLINE: It's called the jungle primary for a reason. Republicans are at risk of being shut out of California's races for governor and U.S. Senate on Tuesday, and Democrats could face the same fate in several congressional races seen as crucial to retaking the House all because voters approved Proposition 14 back in 2010. Sacramento County District Attorney Anne Marie Schubert is taking to texts to get her message out in her bid for re-election in June. Schubert for two months has sought the support of potential voters via messages that pop up on cellphones. Text messaging, said Schubert campaign manager David Gilliard, is just “another tool in the tool box” of a political campaign. Real Justice, which supports Schubert's challenger Noah Phillips, also targets potential voters via texts, said Vince Duffy, Phillips' campaign manager. Campaign texts, though not new, are part of a growing base of media strategies raising concerns among voting rights and privacy advocates. Campaigns, they say, have access to an increasing amount of voters' personal information from which to build detailed profiles of potential voters. Neighborhood polling places are history in five California counties: Sacramento, Nevada, Napa, San Mateo and Madera. They are being replaced by one-stop vote centers, drop boxes and voting by mail. The changes are part of the Voters Choice Act, designed to give Californians more choices on how they can vote. At the Sacramento County Elections office, hundreds of ballots are arriving each day. “We’ve received nearly 8,000 vote-by-mail ballots voted and back in house,” said Alice Jarboe, interim Registrar of Voters for Sacramento County. “And that’s a record for this time period prior to any election that I’ve been involved with in the past 20 years." It appears there’s a surge in voter turnout at a time when Sacramento County is going through some big changes. The card millions of Californians use to register to vote is receiving its first makeover in more than a decade, inspired in part by confusion over how to become an "independent" unaffiliated voter — a problem highlighted by a Los Angeles Times investigation in 2016. "It's an issue that's been lingering for years," said Secretary of State Alex Padilla. "But that was the first time it was really in the spotlight." The Times found a substantial number of Californians who registered with the American Independent Party wrongly believed they weren't part of any political party — an error that later kept some from casting ballots in the state's 2016 presidential primary. "A combination of issues prompted us to see if there was a better way," Padilla said. 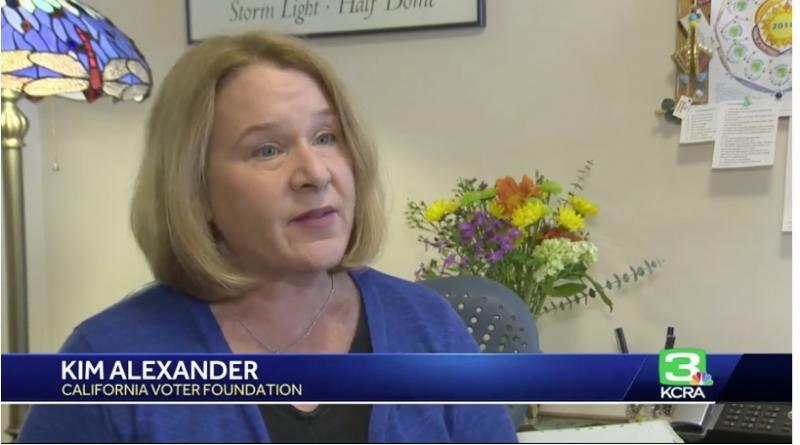 Improving voter confidence in the elections process is part of Kim Alexander's mission at the nonprofit California Voter Foundation. "When they say the Russians are going to come back, I don't think they're kidding about that," Alexander said. Despite the threat of hacking in the 2018 election, Alexander said California is much better protected than other states because of paper ballots. "The combination of a paper-based voting system and routine auditing of election results means that if something happened to our vote count and someone tried to intervene with the election, we would likely detect it," Alexander said. "And we would be able to recover from it."